Create your own marble track and challenge yourself with this new, smart, highly successful construction game. Migoga Spinning contains two new special elements equipped with a simple mechanism that springs unexpectedly to action, as soon as the marble drops from the funnel, directing your marble by turns to the right or the left, and consequently making them travel through exciting and always different descents. 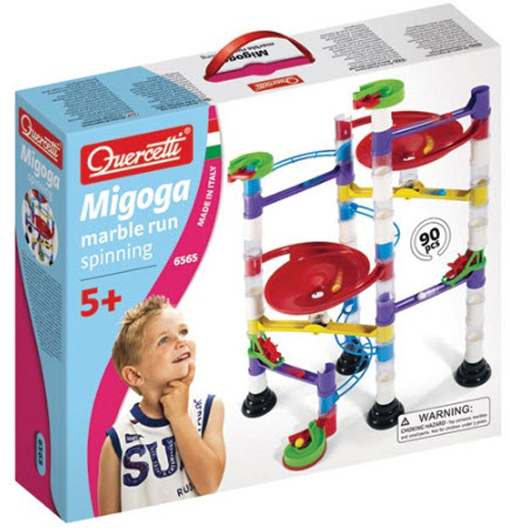 All pieces, slides, bridges, columns, mills, are easily joined in an infinite number of combinations, allowing you to build breakneck tracks, on which you can drop successive marbles in exciting speed contests. Only high quality materials are used that are completely shatterproof, long lasting, and ensure great precision in the joints, and therefore the structures themselves are solid. Creativity and logic are essential to build beautiful and, especially, functional tracks.